Pizza with a chocolate crust! Dorothy's Pizza Cioccolato is the ultimate party ice-breaker! Packaged in a pizza box, Dorothy's Swiss chocolate pizza comes decorated for the season with colors galore. Our chocolate artisans pour a pan of perfect Swiss chocolate, top it with candies and pretzels, then douse it with a drizzle of pure, white chocolate. 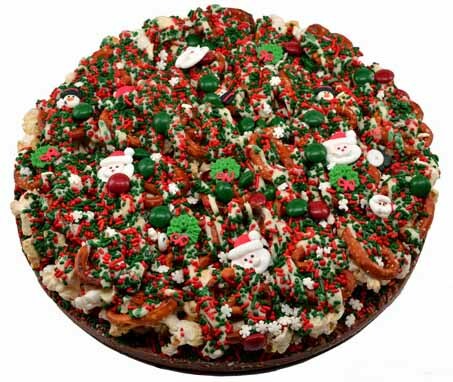 Pizza is topped with candy decorations for each season or for your special occasion. (Want something special? Call ahead, and we'll make it!) This fabulous treat is the ultimate crowd pleaser! From Anonymous of Pittsburgh , Pennsylvania on 12/29/2017 . From Diana Fletcher of Murrysville, Pennsylvania on 12/11/2014 .